Picture this: a 100% YES vote in both the House and Senate — practically unheard-of today. No angry outbursts after the votes were counted. Instead, congressmen from both parties shaking hands and laughing like old friends. For good reason: They had just passed a plan to protect and secure America’s undisputed status as the world’s TOP superpower. And now this act has been signed into law, triggering a $270 billion investment across the United States. That money is being rolled out RIGHT NOW. Even better: A handful of regular folks are rolling in their own riches from this spending bonanza. We’re talking consistent, reliable checks of $1,818 or even more. For the first time ever, we’re publishing the details of this unique program. 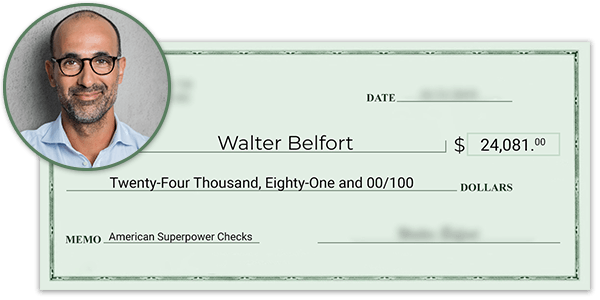 And as you’ll see, you could start collecting these checks without any real work. All it takes is a simple two-minute decision to see just how much you qualify for. And this one choice can trigger a steady stream of payouts that lasts for 5, 10, even 15 years or longer. Imagine collecting as many as a dozen checks of $1,818 or more every year for the rest of your life. Without working for them. And on top of any Social Security, pension, or other income streams. Because you believe in America. Because you support America rising up again and reclaiming its greatness. I call them American Superpower Checks. And let me tell you: They can make a tremendous difference in your cash income. Take Tim Carpenter, a 36-year-old from Texas. His latest check was for $1,818. 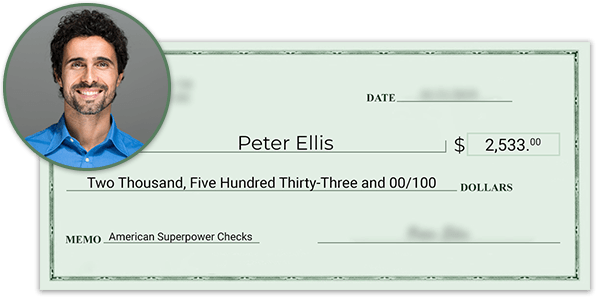 Peter Ellis recently cashed a $2,533 check. Roger Bly, 67, received a hefty $3,990. 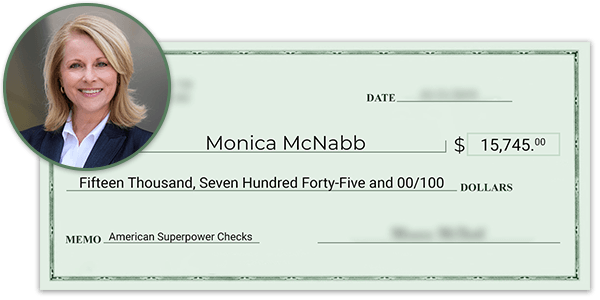 And Monica McNabb just collected a single payout of $15,745. But get this: That’s just ONE paycheck. Monica qualified for four of these paydays per year... to the tune of $62,981. That’s not a salary. Monica isn’t working for this money. These checks are coming from an agency acting under the direction of the federal government. They’re mailed out to folks like Monica who have signed up to receive them. 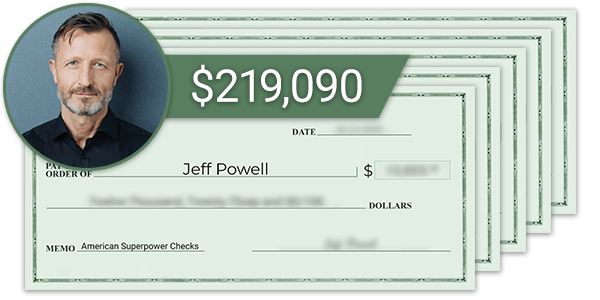 Jeff Powell enjoys a staggering windfall of $219,090 every single year. That’s enough to enjoy many of life’s luxuries and have change left over. Take your dream vacation. Buy that classic 1970 Mustang. Treat your family to their best Christmas yet. And enjoy that newfound wealth year after year. Better yet, you can start receiving your checks TODAY. Here’s where it pays to read the fine print. There’s a unique clause in a 1981 IRS regulation that determines how this money must be distributed. It essentially sets aside a portion of this $270 billion windfall to make it available to everyday Americans who know how to ask. The money is being spent. Now, some of it can be yours. And it doesn’t take many American Superpower Checks before you realize they could end your money worries for good. Pay off your bills. Save for the future. Treat yourself. You choose — the money’s yours. And you can start collecting your own payouts today. Simply follow the steps I’ll give you today, and you can start picking up these 100% passive paydays. 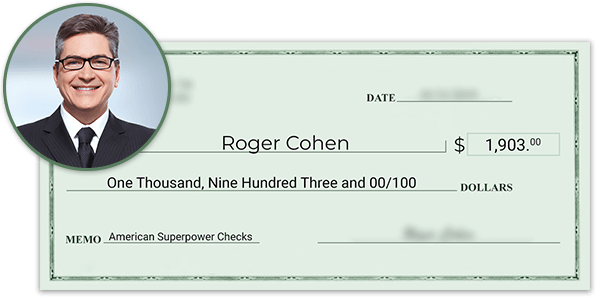 Roger Cohen, a 48-year-old from Oklahoma, regularly gets a $1,903 check in the mail. Oscar Romero, 65, just cashed a check for $2,520. 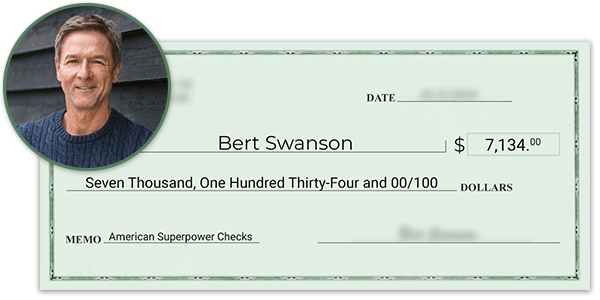 Bert Swanson just held a celebration thanks to his latest payout of $7,134. 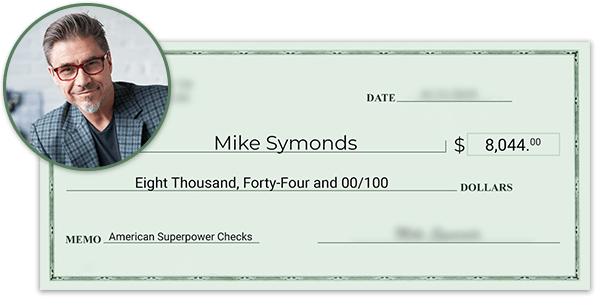 And Mike Symonds recently collected a tremendous $8,044 check. I know, it’s incredible. And best of all, you can join these folks. Proud Americans like you and me can pick up at least one American Superpower Check every three months. And in fact, you can even get as many as 24 per year. And it doesn’t happen just once. You get to enjoy regular, consistent four-figure checks — more than one for every month of the year — for the rest of your life. Yet even more incredible is that now that he left the White House, he’s started collecting these checks himself. Today, you’re going to discover EXACTLY how you can start collecting the checks from these designated agencies, too. Without doing any real work. Something at the very core of why America is the world’s sole superpower. And it’s not our economy. Yet it’s the reason China and Russia have been given the space to rise again. Why Iran feels emboldened to swear harm on the United States. And why even energy titan Saudi Arabia is going rogue. In fact, this crucial problem means we’re facing more direct threats to our leadership than ever before. Though let me be clear: It’s not an irreversible trend. Congress is following a clear path that will put America back on top as the undisputed, unmatched superpower. And everyday Americans now have their chance to grab a share of this $270 billion windfall. America CAN’T keep its status as the world’s superpower without strong infrastructure. Donald Trump’s 2018 budget proposal had $1.7 trillion dedicated to fixing and building new bridges, ports, and everything in between. Washington can’t agree on much, but talk of a bipartisan across-the-board spending push is already underway. Congress already came together to address our most urgent need: updating and expanding our ENERGY infrastructure. And right now, America’s energy network isn’t fit for keeping us on top for the next century. Or even the next decade. On September 29, 2015, a North Dakota farmer found oil spouting from a six-inch pipe onto his property. The pipeline was more than 20 years old. It was built in the Bakken boom of the 1990s, when far less oil was flowing out of the region. It was under-maintained and corroding. By the time the leak was stopped, 20,600 barrels had spilled. That’s more than $1 million worth of oil, even at rock-bottom prices. All because of old, corroding pipelines. Thankfully, the spill was contained and cleaned up. But that pipeline isn’t the oldest or worst pipeline in America. We have 2.6 million miles of oil and gas pipeline. And 45% of the oil pipelines across America are more than 50 years old. There are even pipelines from the 1920s still in operation. Which is why Congress has already taken action. They realize America’s energy dominance hinges on our pipeline infrastructure. The bill’s passage got very little media attention. Yet it’s the reason regular folks across the country are already collecting American Superpower Checks, and why you can, too. I’ll explain how shortly. First, I’d like to show you more examples of just how much money is up for grabs. Hundreds of Americans are already raving about it. Like Dan Spencer from Texas. He recently cashed a check for $1,596. Holly Vaughn, 60, banked a hefty $4,474 check. And Chase Kelly, who lives in San Antonio, collected $9,808 just for being enrolled. America owns the global energy market. The oil boom in the early 20th century put us on top. Even in the last part of the 20th century, when we no longer produced the most oil, we still controlled the market. It’s been one of our major secrets to global economic dominance. In fact, it played a crucial role in the collapse of the Soviet Empire and the end of the Cold War. And yet our hold over the energy market is slipping. Which is precisely why we’ve seen Russia challenge us in Syria, China build islands in international waters, and even Saudi Arabia go rogue. To maintain our role as the world’s dominant superpower, America must double down on our energy dominance. And we are. In December 2015, they lifted the oil export ban that had been in place since 1975. Then in 2016, they unanimously passed the PIPES Act. And ever since, we’ve been producing — and selling — more oil. As of September 2018, America has once again grabbed the podium as the world’s top oil producer. And our oil exports are hitting new records. We sell at least 2 million barrels of oil per day. We even broke the 3 million barrel threshold recently. The world is once again lining up to buy from America. AND you need to build new pipelines to tap into newly discovered reserves and bring more energy products to export markets around the world. And this is the secret behind the American Superpower Checks I’m going to show you how to collect today. Now, I realize what I’m telling you might surprise you. Most folks outside of the energy sector are totally unaware of the PIPES Act and how it has given birth to the American Superpower Checks jackpot. Frankly, I would be surprised, too, if I didn’t watch and research the energy markets for a living. My name is Keith Kohl. For the last decade and change, I’ve been at the front line of America’s quest to reclaim the global energy crown. See, back in 2007, I was on a road trip to check out some oil projects in Alberta, Canada. I’d stopped in North Dakota on the way. I got checked into my hotel and found a little saloon to grab a beer and wind down from a long day on the road. So after doing some legwork myself, I saw how new fracking technology was about to unlock a brand-new Bakken boom — and put a fortune into the pockets of many fast-moving investors. I began researching it, and I found that the best opportunities were in small producers on the brink of ramping up production in the region. I knew these stocks would take off as the Bakken started to boom again. That’s exactly what happened. And just months later, we’d made ourselves a small fortune. 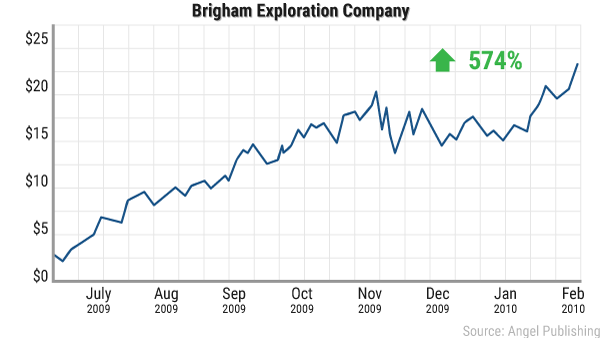 One of our first winners came from an under-the-radar firm that had already figured how to get more oil from the Bakken: Brigham Exploration Company. In just a matter of months, it delivered a 574% gain for my readers. That’s enough to turn a humble $10,000 investment into $67,400. It wasn’t the only winner. 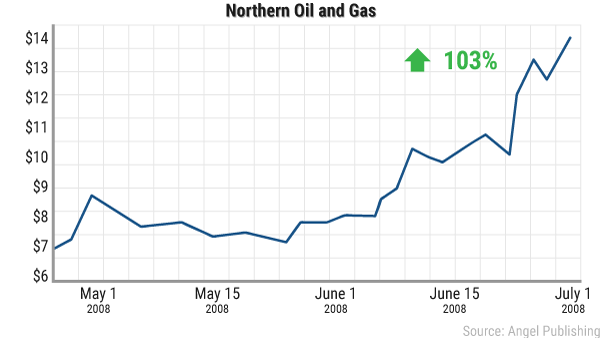 We scored a 103% gain on Northern Oil and Gas as it brought its first Bakken projects online. Your $10,000 would’ve turned into $27,000 in just two months. 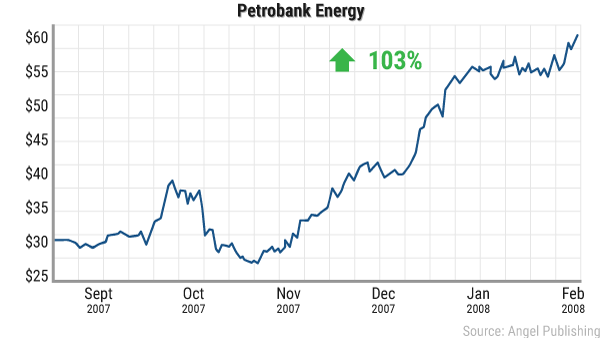 And we picked up a quick double on Petrobank Energy in just six months. All told, we booked six opportunities to DOUBLE your money and three to triple or better. In fact, over 60 trades in three short years, we booked just six losing trades and 54 winning trades. That means for every one loser, you could’ve locked in nine winners. Any money manager would take that record in a heartbeat. I don’t tell you this to brag but to show you the kind of money you can make in the energy markets — no matter what the mainstream media says. I spoke to my industry contacts. I called in favors to identify the best agencies involved. And soon enough, I’d discovered a unique spending program that insiders were already tapping into. That’s what led me to the American Superpower Checks opportunity I’m sharing with you today. And in just a moment, I’ll show you how you can join the energy insiders and everyday Americans who are grabbing their share of this incredible moneymaking bonanza from a small number of agencies mandated to pay out to their distribution lists at least four times every year. I have to admit, the PIPES Act feels like a rather brilliant piece of legislation. And perhaps this is part of why Congress so readily passed it with a rare unanimous vote. Washington funds most legislation with your tax dollars. But not this time. Only a small portion of the $270 billion linked to the PIPES Act is coming through government spending. Instead, Congress wrote the PIPES Act to drive a ton of private investment into America’s pipeline infrastructure. That’s because it was written to leverage a little-known clause in a 1981 piece of regulation. This old regulation created a specific type of agency within the U.S. tax code. And the PIPES Act motivates these agencies to direct an estimated $270 billion in infrastructure spending by energy companies. It essentially creates a profit reinvestment program that certain energy agencies MUST follow to protect and grow America’s superpower status in the energy markets. And it gets better thanks to that 1981 tax code. Because the agencies involved are required to share a cut of this spending with regular folks like you and me on request. Essentially, we’ll see $270 billion in infrastructure spending. As this money is spent — and as that infrastructure helps our energy industry — you can get paid. That’s why you can sign up for these agencies’ American Superpower Checks today... and why you could keep getting paid for life, as America protects its superpower status. Brit Rodgers, a longtime California resident, just collected his check for $2,970. 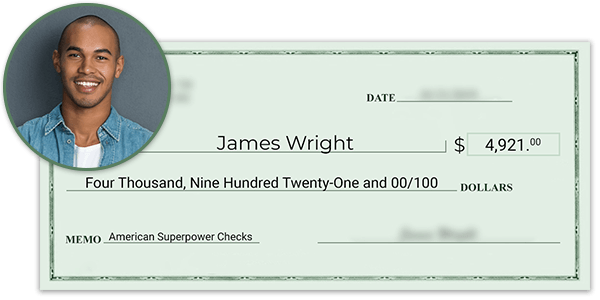 James Wright, a Texan, recently cashed in a $4,921 payday. 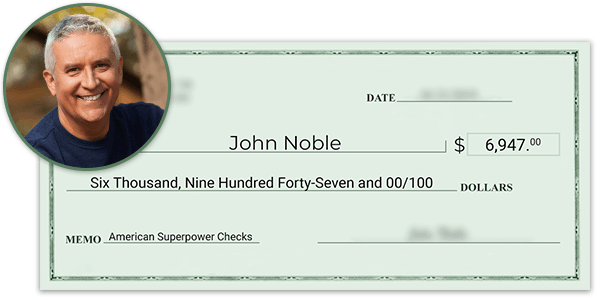 John Noble picked up a tremendous $6,947 payout. Clayton Haddad went one better, scoring a $10,268 jackpot. 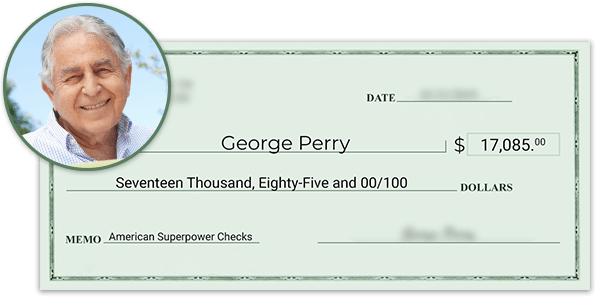 And George Perry did even greater, banking himself a $17,085 paycheck. The best part is you can join these proud Americans in just minutes. You just need to follow the steps I’ll give you shortly to get set up. It’s so easy that you can even do it from your cell phone. And your first check could be for $1,818 or even more. In fact, I’ve just completed exhaustive research on the American Superpower Checks. And have discovered SIX different agencies paying out these checks from a mix of energy infrastructure spending programs. You can pick and choose which of these you’d like to use to start collecting paydays all throughout the year. The more you participate in, the more checks you stand to collect — up to 24 per year. Over the next few minutes, I’m going to tell you about these programs and agencies. Then, I’ll give you the specific instructions you need to take to get on each distribution list today. America has 2.6 million miles of pipelines that need constant monitoring and inspection to protect the country’s energy infrastructure. And as part of the unanimous congressional vote, inspectors are now being sent out to spot-check pipelines all over the country. Yet my investigation has revealed that members of the industry aren’t sitting on their hands and waiting idly by. They’re not risking being slapped with a fine or public shaming if their infrastructure doesn’t hit the mark. So they’ve just ramped up their OWN inspections by turning to a special “private agency” that coordinates these checkups with over 1,200 inspectors in the field. As you might expect, that means a lot of money is now changing hands — more than $300 million per year. And because of the nature of this agency, its IRS status, and its involvement in this energy infrastructure program, it’s required to pay out a portion of this money on request in the form of American Superpower Checks. Here’s the most incredible part: The checks that come from this inspection agency can add up to a small fortune every single year. 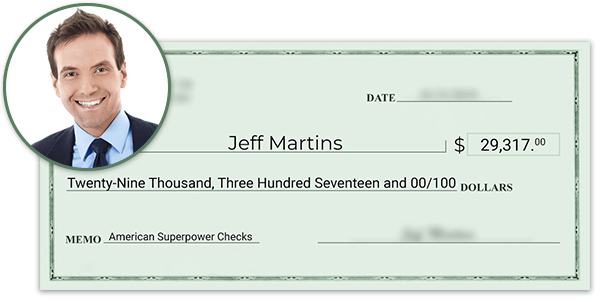 In fact, Jeff Martins recently announced that he collects $29,317 every single year through just this one program. Sometimes it’s a small repair because of something that turns up on an inspection. Sometimes it’s a capacity increase on a current line. And other times it’s a technology or equipment upgrade to help the whole network run smoother, safer, and more efficiently. The point is, America’s existing energy infrastructure is constantly being maintained, upgraded, and overhauled. That’s why a significant chunk of the $270 billion windfall behind these American Superpower Checks goes into ensuring that America’s 2.6 million miles of pipeline remains the best in the world. And one of the key private agencies involved with American Superpower Checks oversees well over 200,000 miles of oil and gas pipelines across North America. That’s a lot of pipelines. And as a result of Congress’ unanimous vote, this agency is recommitting to its maintenance projects. For example, just one pipeline crossing three states in the northern U.S. is getting a $2.9 billion investment. Yet it’s just one of 24 separate projects to which this agency has committed billions of dollars. The most exciting part, though, is that this agency is also mandated to pay out American Superpower Checks. Take Christine Lynn. She picks up $12,157 annually from this incredible income stream. 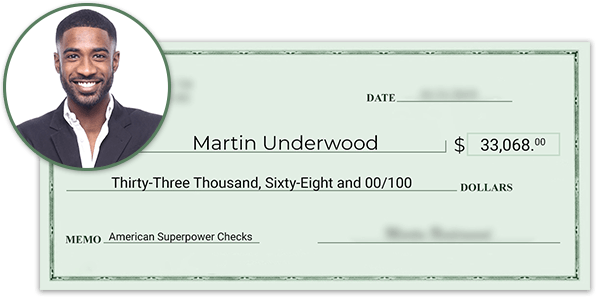 And Martin Underwood banks $33,068 every single year. And in just a moment, I’ll show you how to access it for free. First, you need to know about the most important part of Congress’ plan to ensure America continues on as the world’s sole superpower. Here’s something most folks don’t know. After all, news like this doesn’t make the headlines unless oil and gas prices are at all-time highs. Yet the fact is, there’s a lot of exciting growth in the American energy industry. And the United States Geological Survey just broke the news of the largest discovery of continuous oil in America ever. This single discovery, in just one small part of the country, could provide the U.S. with enough oil to last more than six years! Of course, this means pipeline capacity has become a more important part of our infrastructure than ever before. That’s why the flagship program of Congress’ plan to protect America’s superpower status is to build new state-of-the-art pipelines across the country. This, in turn, helps our energy producers pump even more oil and gas that can be brought safely and quickly to market — both here at home and exported abroad. That’s why we’re already seeing multiple agencies ramp up their investment in new pipelines. In fact, one agency just boosted its spending from $650 million to $2.6 billion per year. Once again: I’ve uncovered how you can collect American Superpower Checks from this expansion in energy dominance. Yet not just from one agency. Congress is going ALL IN on boosting pipeline creation. And I’m tracking multiple private agencies that are paying out checks right now. 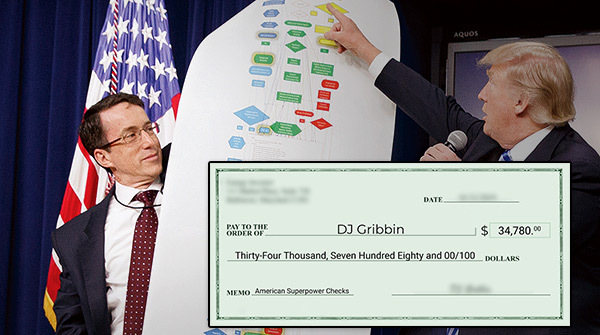 In fact, one of the agencies is being tapped by Trump’s ex-infrastructure advisor, DJ Gribbin, for a hefty $34,780 every single year. Yet even if you collected your paydays like Anthony Vance, 63, you’d enjoy a payout of $9,671 this year. And remember, that’s his income from just one agency. 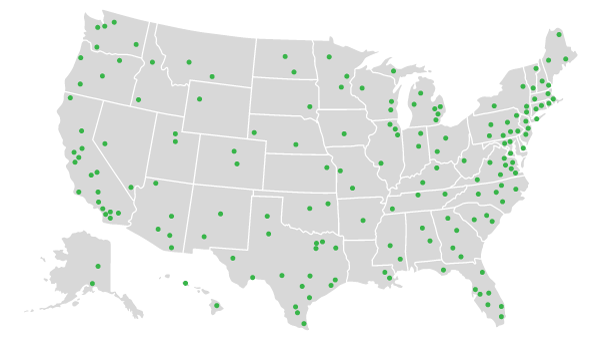 Altogether, you can pick up paydays of $1,818 or more from six different agencies. Today, you’re going to get the full details on this unique opportunity to collect American Superpower Checks — including how much you qualify for — inside your personal copy of my latest research report. Each of these six agencies pays out four checks each year. All in, with this report in your hands, you could collect as many as 24 checks per year. That’s two per month on average! Given that each check could be worth $1,818, you might expect to pay a pretty penny for this special report. 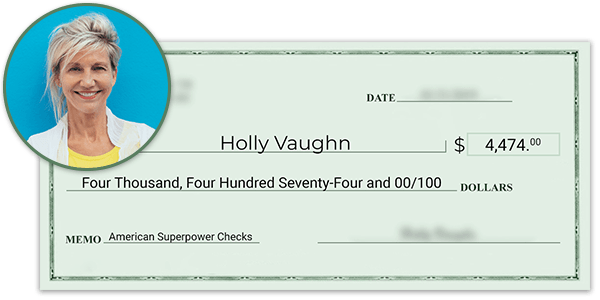 I’ve worked with my publisher to put together an offer to make my research into Superpower Checks available to every proud American who wants to participate. 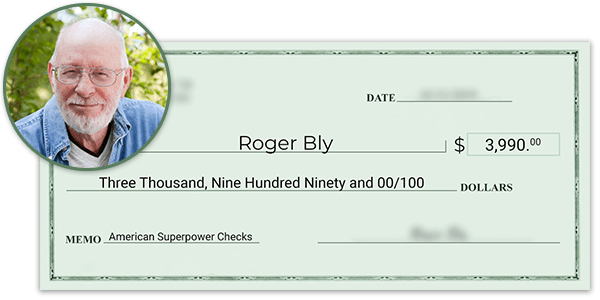 So for a very limited time, you can grab your own personal copy of “American Superpower Checks: Collect Consistent Paydays of $1,818 or More” completely free and with ZERO obligation when you accept a risk-free trial of Energy Investor. Listen, I know the energy market is a bit unloved right now. In fact, most pundits in the media will tell you to stay away. But the truth is, there’s really a ton of opportunity in the energy markets right now. Some sectors, like pipelines, aren’t whipsawed when the price of oil goes up and down. That’s because a pipeline makes profits based on how much is pumped, not how much the oil costs. So they’re still gushing profits, and that’s only reinforcing spending on the programs behind the American Superpower Checks. Not only that, but there are also great companies that are cheap thanks to the media’s misguided hatred of oil and gas right now. I’ve seen the same thing happen over and over again. Investors who buy at today’s prices stand to have many opportunities to double their money, if not a lot better. Every resource market, including energy, is cyclical. Prices go up and down. That’s what they do. The smart investor doesn’t wait for prices to go up to get in. Because they know the biggest profits come from buying great companies when the market puts them on sale. Bottom line, there’s money to be made RIGHT NOW. And besides, no matter what is happening with the price of oil, you’ll be cashing your American Superpower Checks for as much as $1,818, if not more, as long as you sign up for the distribution list in time. 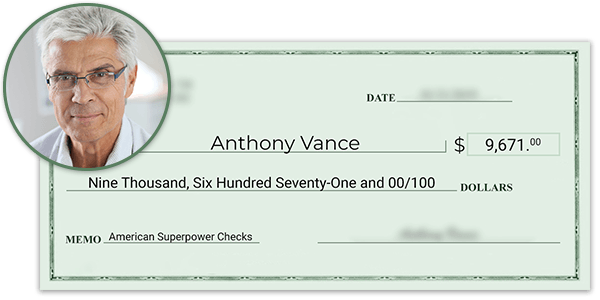 I’d like to send you a personal copy of my full report on exactly how to start collecting these checks today. Better yet, it’s yours free when you try out my Energy Investor advisory with no obligation. 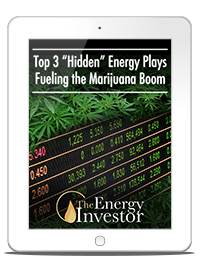 As well as the best moneymaking opportunities throughout the energy markets — for investors and everyday Americans. Oil and gas, yes. But also alternative energy plays. In fact, I put my readers onto the lithium and energy metals boom long before electric cars were making daily headlines. 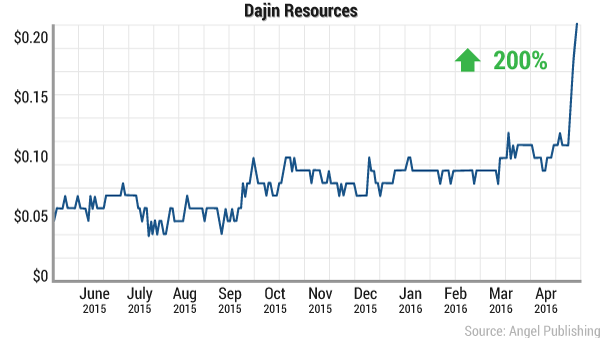 One of my first picks in this market was a lithium producer called Dajin Resources. While most folks were still unsure if Elon Musk could make an electric car for the everyday American, I uncovered this tiny firm in Nevada. It was just a stone's throw away from Tesla’s Gigafactory site, which would need A LOT of lithium to make its batteries. I got my readers in at $0.06 a share in May 2015. Just 10 months later, we sold out for a 200% profit. That was good enough to turn $10,000 into $30,000. Just imagine: In less than a year, you’d have tripled your money. Most folks will never know what it’s like to experience the excitement of seeing that happen. Yet you will as a new member of Energy Investor. Because along with your personal copy of my latest research, showing you how to collect up to 24 American Superpower Checks per year, you’re also going to get a full toolkit to help you profit from other energy plays over the coming months. A monthly member newsletter, with at least one new opportunity to profit from America’s energy boom every month: I’m always uncovering opportunities like the ones you’ve seen today — opportunities for both income and investment profit. And you’re going to receive a full write-up of my most lucrative finds during the first week of each month. In fact, each issue is so exciting that you may want to schedule dedicated time to read through each one. Investment updates: If I ever need to share a development with you, you’ll receive an immediate update straight to your email inbox. It could be time to sell a stock and take our profits. Or it could be a way you can increase your potential payout by taking a specific action. Whatever it is, you’ll never be left in the dark. I promise to always keep you updated. 24/7 portfolio access: To help make getting richer as easy as possible, I compile every opportunity into a portfolio you always have access to. You simply need to log in to the members-only website, and you’ll have every open position in front of you, including your buy date, current profits, and much more. Special reports: Occasionally, an opportunity is so urgent and so lucrative that I’m forced to write up a special report I can immediately send to my readers. If that happens, you’ll have it sent to your inbox. And if an opportunity still has room to pad out your retirement account, then you can find the special report in a dedicated section of your Energy Investor member site. Archives: If you ever want to look back at a past investment thesis or even just read my past work, you can. Each and every issue is kept in a handy archive you have fast access to. Free subscription to Energy and Capital: By joining Energy Investor, you'll also get a free subscription to Energy and Capital automatically added on to your benefits. Every week, you'll have full access to my thoughts and analysis on the energy industry, as well as the exclusive opportunities that help our investment community recognize the kind of wealth you can create in today's market. A friendly customer service team, at your service: Should you ever have any questions or concerns, you can call our team at any time and get live help Monday through Friday between 9:30 a.m. and 4:30 p.m. (ET). It doesn’t matter how big or small — if you have any issues whatsoever, they’re ready to help you. 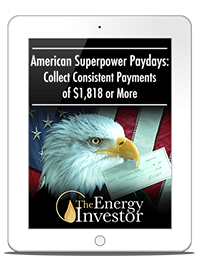 Again, you’ll get all of these perks on top of your personal copy of “American Superpower Checks: Collect Consistent Paydays of $1,818 or More” when you try Energy Investor today. The retail rate for Energy Investor is $249. I’m going to make you a special offer you won’t find anywhere else. Today only, you get in the front door for just $99. 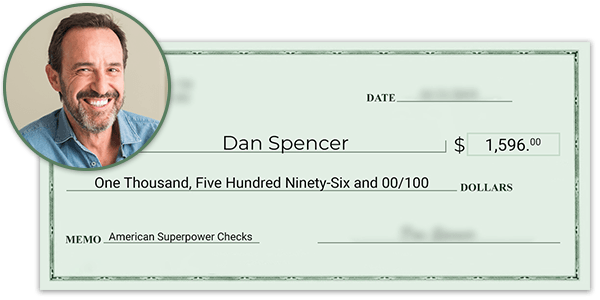 As soon as you do, you’ll have instant access to the special report that shows you how to claim up to 24 separate American Superpower Checks every year, for as much as $1,818 or more. Plus, you’ll get six months to see what else I offer in Energy Investor, with zero risk or obligation. First, I guarantee you’ll be able to use my research into American Superpower Checks to sign up for at least one distribution list for four separate checks every year. Of course, it could be more. You could receive up to 24 separate checks every year, each one making you as much as $1,818 richer, if not more. But I guarantee you’ll find this research easy to follow and be able to get signed up for at least one program within the next six months. 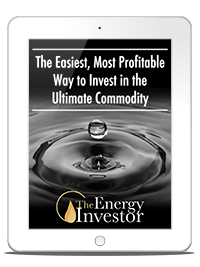 Second, I guarantee that as our newest Energy Investor member, you’ll find one or more additional opportunities that you legitimately believe could double your money or better during your first year of Energy Investor membership. Because I want you to explore the moneymaking opportunities beyond the American Superpower Checks... opportunities you get exclusively through your Energy Investor membership. The fact is, while you could receive a personal fortune over your time collecting these checks, you could see even bigger paydays from other plays inside my service. In which case, you’re free to request and receive a prompt and courteous full refund of your entire membership fee. And if you cancel your trial at any time in the first six months — even after signing up for one or more American Superpower Checks programs — you can still keep my research into this unique opportunity as my thank-you for giving Energy Investor an honest try. Assuming I do my job and you experience both of these moneymaking events, you don’t have to do anything. Your membership will continue for a full 12 months at no additional cost. You’ll save $150 and lock in 365 days of front-line research in the most exciting energy market since the shale boom. A new wave of pot legalization is creating spinoff profits in an unexpected industry: energy. Of course, the obvious opportunities in pot stocks have come and gone. But with more and more states — as well as countries around the world — legalizing pot, there’s going to be a wave of profits in places most folks never suspected and that most folks will miss out on. You see, growing marijuana requires a lot of energy. Ron Flax, who works for Boulder County, Colorado, says as much as 20% of the cost of growing pot comes from electricity costs. And I’ve identified three specific energy-related companies whose profits will only grow as a result of current and future legalization. There’s the Colorado energy firm that’s getting more and more “legal weed” business as a result of statewide mandate D 2017-015. There’s the tiny $50 million firm with cutting-edge lighting technology to help growers increase their yield. And there’s one more speculative play with incredible upside that I have to keep secret for now — at least until you read the report. Because too much trading volume could spike the stock price higher, and we need to let the market behave naturally. If I revealed what it was, you wouldn’t believe me. And because of population growth, an ever-increasing demand for food, and the effects of a shifting climate, we’re about to become even more desperate for it. We’re hurtling headfirst toward a shortage of this commodity that could literally upset the balance of civilization. It’s even been tied to recent disasters, including the horrendous California fires in late 2018. I don’t like to celebrate someone else’s crisis, but there are businesses that profit by helping others guard themselves against the crisis. And I’ve identified a company that is proactively trying to help America against the growing threat of a shortage of this crucial commodity. Which means it’s at the center of an urgent problem that Washington, state governments, and even individuals will be throwing money into to solve the crisis. Again, both of these reports are yours free, to review within minutes, when you agree to try Energy Investor. That’s $197 in free research. The bottom line is that you’ll have everything you need to grow much, much richer over the coming weeks and months. And it’s yours for just $99, risk-free and without obligation. Remember, if you’re not 100% convinced by the opportunities you’ll find inside, then you’ll get a prompt and courteous refund from my team. 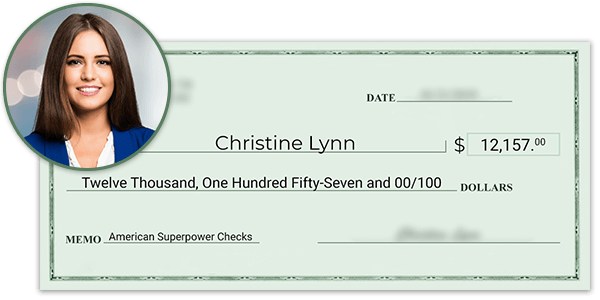 And whether or not you stick with Energy Investor, you get to keep the American Superpower Checks guide completely free — and all the dozens of checks it can get you every single year. Yet you stand to collect income like this from SIX different sources — though only if you set them up today. You see, before the American Superpower Checks are cut, the agencies that send them out have to cut off registrations. This happens roughly once every 90 days for each of the six agencies. If you miss it, you have to wait another 90 days for the next check. 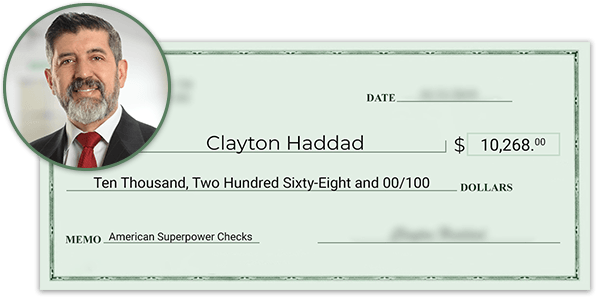 So I urge you, if you plan on collecting your own American Superpower Checks of $1,818 or even more, you must act now. You’ll get your personal copy of “American Superpower Checks: Collect Consistent Paydays of $1,818 or More” as soon as you take out your risk-free trial of Energy Investor.